Souvenir collected by William Noland Berkeley. Lt. William Noland Berkeley, Class of 1936, landed in France six weeks after D-Day and participated in the great Allied drive across the country. On August 17 and 21 he wrote home enclosing souvenirs and describing the throngs of Frenchmen lining the roads and throwing flowers at passing troops while children scrambled into G.I. trucks for free rides. Telegram from Adjutant-General J.A. Ulio to Mrs. Isabella Berkeley. 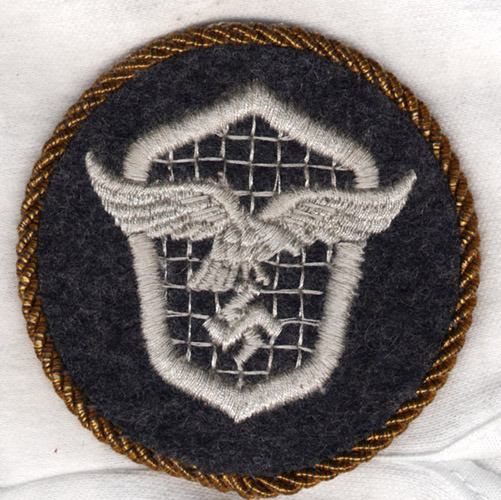 1944 September 15. 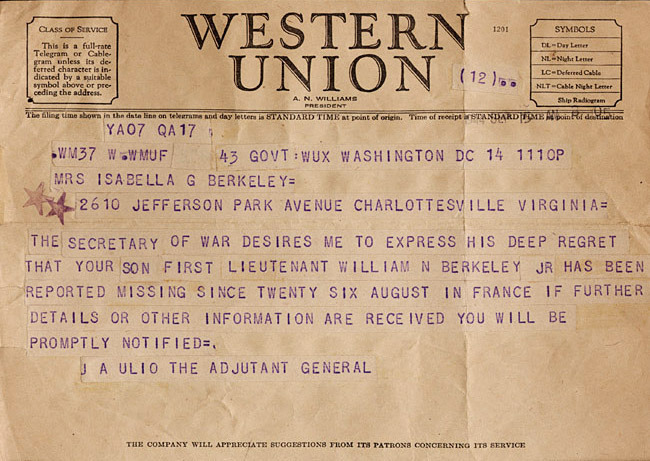 According to a telegram of September 15, 1944, Berkeley was reported missing in action on August 26. For the next few months his parents frantically tried to ascertain his whereabouts, assuming he had been made prisoner and was in a German P.O.W. camp. In February of 1945 they learned the truth. Lt. Berkeley had died in action. 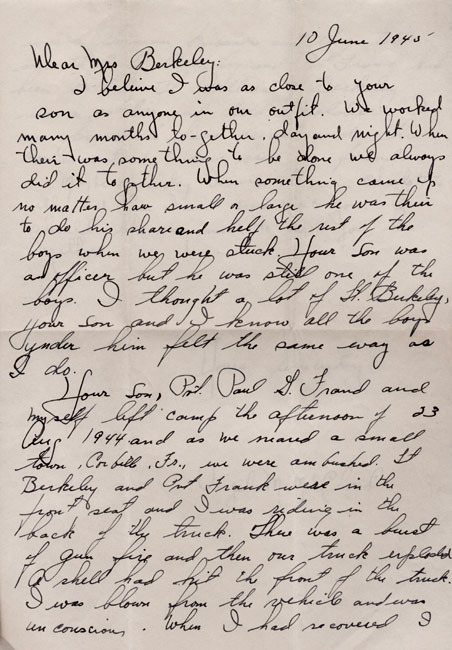 Finally on June 10, 1945, Virgil M. McCloud, liberated from a German camp by the advancing Russian army and the sole survivor of the ambush that killed Berkeley, wrote to Berkeley's parents about his death ending "Lt William N. Berkeley was a soldier and died a soldier. I am proud to have served under his command and to have been his friend."